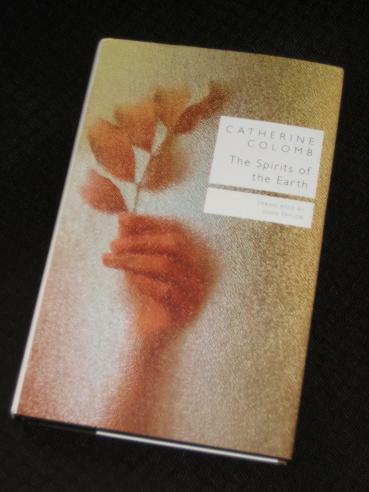 Catherine Colomb’s The Spirits of the Earth (review copy courtesy of translator John Taylor) starts with a bang, plunging the reader into the world of the Swiss upper classes with barely a chance to draw breath. There’s a tragedy on the very first page, as a child called Abraham is said to have fallen to his death from a walkway at the top of his family’s spacious château, and worse still, loud voices are accusing his uncle, César, of being indirectly responsible. The story then moves on (and back, and forwards once more) describing the two families inhabiting the château at Fraidaigue on the shores of Lake Geneva and the Maison d’En Haut up in the hills, slowly explaining the family history. César is the focal point of the novel, albeit one whose thoughts and feelings are hidden from the reader for the most part. Despite his position as the eldest son of a wealthy family, he has been usurped by his two younger brothers, who married at an early age and installed themselves in the two large family properties. César, seemingly content to spend his days in the family vineyards, or lying on the beach by the lake, gazing vacantly into the sky, divides his year into two halves. In autumn, he climbs the path to the Maison d’En Haut to spend six months with his brother Alphonse, returning in spring to enjoy the hospitality of Eugène’s household at Fraidaigue. However, the eldest son’s wanderings act as a sword of Damocles for the other two (and their wives), who are constantly preoccupied by one question – what will happen if César marries and demands his share of the inheritance? Doesn’t memory constantly intervene, creating a parallel life, bringing along hundreds of recollections, fleeting visions, and daydreams until, suddenly – you don’t know why – everything vanishes and for an instant subsists only the image of periwinkle growing around a grave or, in a parlour, white rose petals slowly dropping off, and plunking down on the beige felt tablecloth embroidered with gold thread? Within this seemingly random structure, an order of sorts does appear, allowing a portrait of César to emerge from the chaos. The rhythm of the book comes from the regular movements of the wandering bachelor, defined by the seasons, and there’s certainly a hint of the regular flow of Woolf’s The Waves here. One of the strengths of the book is its construction of the main characters, and even if we usually stay on the outside, we get a clear picture of their motives and fears. Eugène’s wife, called simply Madame by all around (and nicknamed ‘Semiramis’ by the bitter César) is a classic matriarch, an imposing figure of a woman who can crush opposition by her shadow alone, and the sight of her cleaning her fingernails can cow the most contrary visitor. Her husband, by contrast, is a weak figure, a hen-pecked little man hoping the sky won’t fall in one day, following in his Amazonian wife’s wake and secretly regretting his impetuous decision to marry young. The tragedy of the story is that the inheritance, as substantial as it is, won’t suffice for three sons (their sister, Zoé, is nowhere in this race for a legacy…), meaning that the happiness of one brother contributes to the misery of another. As Adolphe and Eugène fret (and Madame plots), César attempts to assert himself and finally get what he deserves. Sadly, his own hesitation and the vagaries of fate combine to push him down once more. The lack of sections and a paucity of paragraph breaks make it hard to put the book down, particularly when time, place and point of view can shift mid-sentence, leaving you floundering until a familiar detail emerges like a rock to cling to in the midst of a stormy lake. Taylor discusses the challenges of translating the novel in the introduction, particularly regarding Colomb’s interesting use of verb tenses, and bringing this story into English would definitely have been a formidable task. Initially, I was a little concerned about some of the obvious Gallicisms, particularly in terms of word order (I’m not a huge fan of making the new text sound foreign), but in this book, with a text which deliberately distances the reader, it actually worked very well. Colomb wasn’t a writer I’d heard of before receiving Taylor’s message, but it just shows (again…) that there are a lot of very good writers out there whose work is waiting to be discovered – and translated. With the usual aesthetically pleasing Seagull Books treatment adding to the appeal, The Spirits of the Earth is a book many readers (those who enjoy something a little less plain) will enjoy. She wasn’t a hugely prolific writer, only producing four novels, so perhaps we’ll see more of her work in English in coming years. I haven’t found a book from the Seagull catalog yet that I haven’t liked. I will have to take a look at this one as well!